← Chemical Brain Drain… What Are We Thinking? Not only do they scare the living daylights out of so many dogs and other creatures, they also pollute our air, water and bodies! Are We Celebrating Life or Death? Are these substances life supporting? Perhaps we should celebrate with life supportive ways instead? The State Fire Marshall, an office within Cal Fire, has the statutory mandate to manage seized fireworks which are hazardous waste in most cases. Note, some sites are including a campfire in their supposedly non-toxic alternatives suggestions, but woodsmoke is highly problematic as well. This entry was posted in Chemicals, Environment, Environmental Health, Health and tagged celebrations, fireworks, hazardous air pollutants, toxic, toxic trespass. Bookmark the permalink. I can’t be near fireworks, especially those on the ground. I get a sulfur taste like I get from matches only multiplied by 100. This always makes me sick. So many people and other critters are made ill from these things! 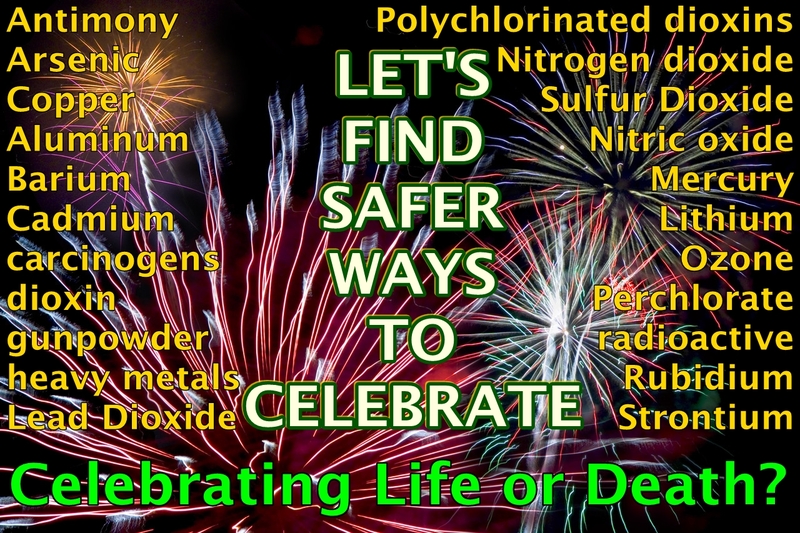 We humans are a creative lot (or can be), so I am sure we can find plenty of safe, life supportive ways to celebrate occasions without fireworks, fire, gunpowder, balloons, or other things made of toxic and/or petroleum based materials. We could plant more shade trees and flowers, berry bushes or fruit trees, things that offer sustenance to ourselves and others! Anything that makes others happy that doesn’t harm anyone or anything else is a good way to celebrate! I know about the wood smoke. I was just gardening and had to quit and run in a and shut all my windows because someone lit one. Another thing I read about fireworks is how when neighbors randomly set them off it can effect combat veterans because they sound so much like gun fire. I will be watching my non-toxic fireflies light up my backyard for the 4th. I takes my CNS hours to recover from fireworks that are done nearby. I don’t know how people survive in war zones if their health is in anyway compromised. I also have serious adverse effects from the bass boom sound systems, they alter my heart rate. I can’t wait for the day when it’s no longer acceptable to pollute the air, water, and soil we all depend on for life! I read another article how July 5th is usually the busiest day of the year at local animal shelters. Pets get so freaked out by the loud noises from fireworks — they run away. Yes, they terrify pets and wildlife, sometimes permanently. • We report early-July hourly particulate (PM2.5) levels at 315 US monitoring sites. • PM2.5 concentrations are elevated on July 4 evening and July 5 morning. • Increases are largest at 9–10 pm on July 4 and diminish by noon on July 5. • On national average, holiday 24-hr PM2.5 levels are elevated by 5 μg/m3 (42%). • A site adjacent to fireworks shows 48 μg/m3 (370%) increases in 24-hr PM2.5. The Federal Hazardous Substances Act classifies fireworks as hazardous, because the explosives can have dangerous side effects, including fires, injury, and death. Air pollution is another potentially harmful effect of fireworks (Wang et al., 2007), which release gaseous sulfur dioxide, carbon dioxide and carbon monoxide; hazardous trace elements such as aluminum, manganese, and cadmium; and particulate matter (PM), evidenced by visible clouds of smoke during displays. I watched part of the national fireworks display on TV and was amazed the size and density of the cloud produced — it was so dense it was what drew my attention rather than the fireworks. I changed the channel. I couldn’t watch knowing little kids were breathing all of that in. Fireworks mean that New Year’s Eve can be a dangerous time for birds. Should we try alternatives to blowing stuff up? The authorities in the Galapagos islands have banned the sale and use of fireworks in the archipelago to protect its unique fauna.